When Should You Worry About Doggy Diarrhea? Diarrhea is one of the most common reasons why pet parents seek veterinary care for their canine companions. 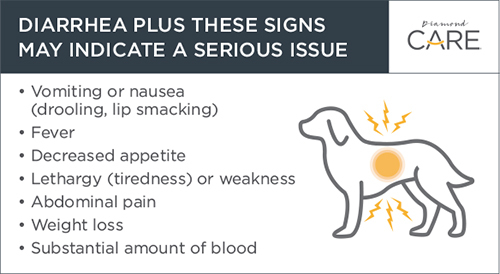 While it can be triggered by something as simple as a change in food or treats, doggy diarrhea can also signal a serious underlying disease. Doggy diarrhea is a sign of a health problem; it isn’t a disease itself. The most common mechanism by which canine diarrhea occurs is when unabsorbed nutrients either retain water or draw water into the intestines. In these cases, the volume of fluid overwhelms the ability of the intestinal lining to absorb water and nutrients. Dogs with this type of diarrhea will pass large amounts of fluid or soft stools. Another common mechanism of diarrhea in dogs results from increased permeability of the intestinal lining. Inflammation associated with disease or irritating substances can cause increased movement of fluid and electrolytes into the intestines and impaired absorption. Diarrhea can occur suddenly (acute), last for weeks to months (chronic) or occur off and on (intermittent). It depends on the underlying cause. Dogs develop diarrhea for many different reasons. Abnormal stools can occur any time the movement of water or nutrients across the lining of the intestines is altered or disrupted. For example, when your canine companion eats something that’s not part of his or her normal diet, the normal bacteria present in the intestines may be changed, which can lead to acute diarrhea. Diarrhea can also signal health problems such as pancreatitis (inflammation of the pancreas), parvovirus infection and liver disease. In these cases, inflammation and/or damage to the intestinal lining are the mechanisms behind the diarrhea. What does the stool look like? What color is it? Is there any blood or mucus? Has your dog gotten into the garbage or compost recently? Have there been any changes in your dog’s food or treats? Your veterinarian will want to determine if your dog’s diarrhea is associated with the small intestine, large intestine or both. Small intestinal and large intestinal diarrhea have different causes, may require different diagnostic tests and will likely be treated differently. With small intestinal diarrhea, you’re likely to see large amounts of stool that range from very watery to semi-formed. Defecation frequency is often normal, but could be slightly increased. Stool that is extremely dark or black suggests bleeding may be occurring in the stomach or the first part of the small intestine. Flatulence (gas), stomach or intestinal noises, or vomiting may occur at the same time. Dogs with large intestinal diarrhea tend to pass smaller-than-normal amounts of semi-formed stool that may be covered in or contain mucus. Dogs typically strain to defecate in addition to passing feces much more frequently than normal. If blood is present, it’s usually bright red and fresh looking. A single bout of diarrhea is generally not a cause for concern. In fact, many acute diarrhea cases will resolve on their own or with basic home care in one to two days. If your dog had one somewhat soft stool but is otherwise playful and eating normally, you can wait to see what the next bowel movement looks like before taking further action. You don’t want to let diarrhea persist beyond two episodes if your dog has a preexisting health problem such as diabetes, kidney disease or Addison’s disease; is very young; is a very small or toy breed dog; or is well into his or her senior years. These dogs can quickly succumb to dehydration, so you’ll want to notify your veterinarian right away. You’ll also want to have your dog examined by a veterinarian if diarrhea lasts for more than two days or if he or she has other symptoms along with the diarrhea. Dehydration and a host of other complications associated with diarrhea can occur quickly. Be aware that intestinal obstruction resulting from ingestion of toys or bones can be associated with intense pain, vomiting and straining to defecate but passing only small amounts of watery stool, often with blood. An obstruction is a true emergency that requires immediate attention and treatment. When in doubt or when concerned about your furry friend’s diarrhea, give your veterinarian a quick call. Your veterinarian can determine whether the problem is urgent based on the history and description you provide. He or she can also provide the best advice on how you can manage your dog’s health.